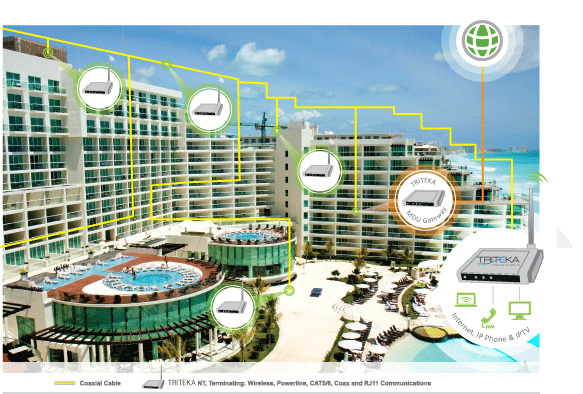 Many people think that upgrading older hotel TV systems to new advanced digital systems requires new wiring. Mor Miller, CEO of Triteka explained to me at the TelcoTV trade show that it is possible to convert old hotel TV systems into new digital systems without significant wiring changes. Existing hotels and multi-dwelling units (MDUs) commonly have tree structured coaxial cables and low quality telephone lines to each room. Installing CAT5/6 data lines or fiber can be expensive and disruptive to guest operations. To solve this challenge, Triteka created the EOC Series of product that allow hotels to upgrade their existing wiring systems to provide ultra high speed data services. This “No New Wire” upgrade solution is relatively inexpensive, installs fast, and can co-exist with existing communication systems and devices. It can use a mesh topology that eliminates the need for a dedicated cable for each room. The current data rates for a single coaxial line is 500 Mbps. Future multi-frequency versions offer the potential of over 5 Gbps (10 RF channels).